Halwa in any form is a inviting and mouthwatering one.But here comes a halwa out of ripe papaya,and a tale behind this recipe.My kids don't like this fruit very much and so I have to always think about ways to incorporate this in their diet.Earlier I made the Papaya Milk shake,Papaya Pradhaman/Kheer and this time I gave this a try.The halwa was more successful than the shake, and equally tasty as the papaya pradhaman.I should say and they just enjoyed it.As you all know,the fruit contains low in calories and no cholesterol,but a rich source of phyto-nutrients,minerals & vitamins.Papaya contains easily digestible pulp with soluble fiber that helps to have normal bowel movements; thereby reducing constipation.One of the richest source of Vitamin C(immune booster & anti inflammatory actions), Vitamin A(healthy mucus membrane & essential for vision), Vitamin B complex such as folic acid,riboflavin,thiamine & pyridoxine(essential for metabolism) and a rich source of potassium & calcium.So,Enjoy making this healthy fruit halwa for coming Diwali and other festive occasions or JLT !! -Wash,peel and remove the outer thick skin of papaya. De-seed and cube into pieces. -Boil the papaya cubes in a non stick pan along with 1 1/2 cups of sugar in it. -Let it cook well about 15 minutes and mash the pieces with a wooden spoon,Keep stirring the mix and add sugar as required. -Add the boiled milk in it and keep stirring the mix for about 25 mins-35 mins until it forms a sticky halwa consistency and starts to leave the sides of the pan.The milk and water content completely evaporates by now. -Add about 1 tbsp of ghee and mix well.Add the cardamom powder. -Heat another pan with remaining ghee and fry the cashews followed by raisins. -Add this to the halwa. -Grease a plate and transfer the halwa. -Let it cool and then serve !! 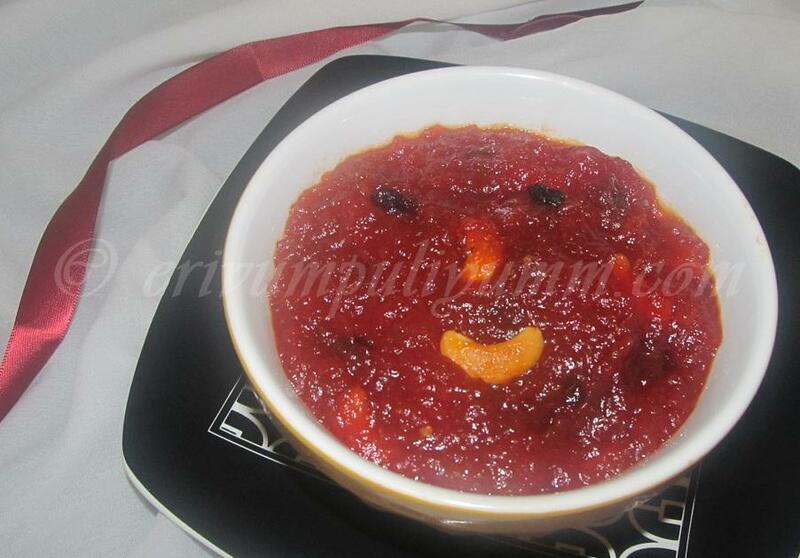 * I used the reddish orange colored papaya and so the color is bright red. Never heard of this halwa. new for me. thanks. like its color.. inviting and tempting.. Delicious halwa, wish i get a bowl rite now. 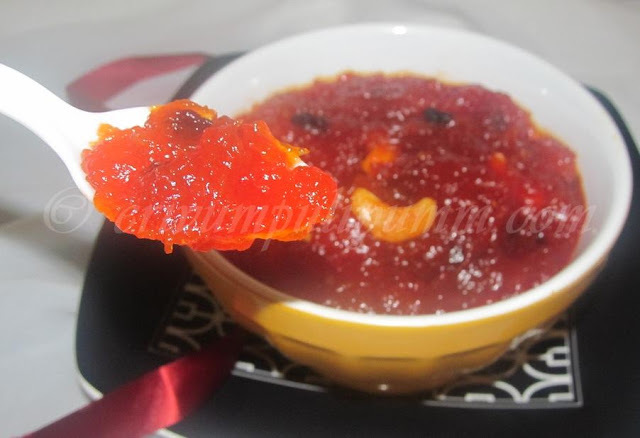 this halwa looks absolutely delightful..
Never tried making halwa from papaya.looks so delicious and tempting..nice colour!! Never had this halwa. Looks very inviting and irresistible one. so lovely... looks so tempting!! Halwa looks delicious, papaya never thought halwa with that. Nice one Julie. 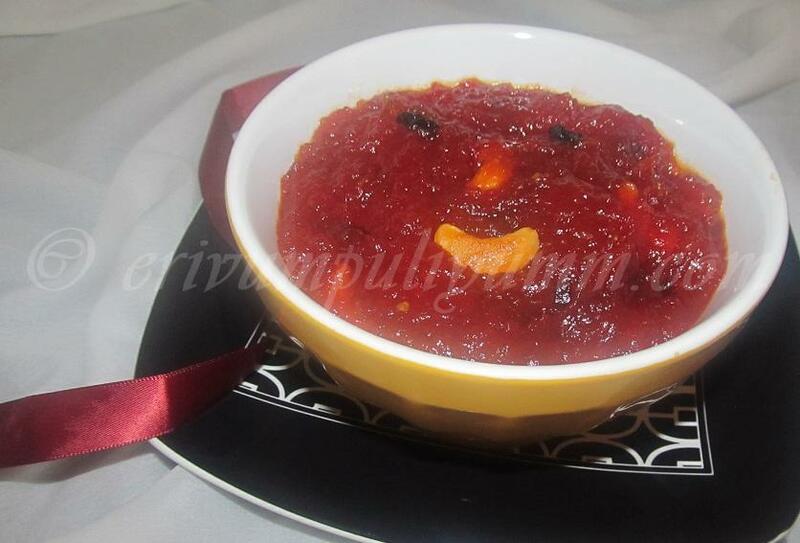 this looks so tempting Julie.. love the rich color..
Pappaya Halwa looks delicious love that color. Yummy. Great way to have a papaya! Yummy halwa.. Love it always.. I like your new image ...and smiley face! hi julie, this looks so delicious. never seen before. bookmarked with thanks. have a nice day.. Unique recipe, never tried it before. Looks so tempting and yummy! Love the new look of your site! @Chitra Dinesh Thanx chitra for the feedback,happy that u liked it! !